Austin Prep catcher Francesca Frelick will be looked upon to lead the offense and break in some young pitchers. There’s some unfinished business at Austin Prep — just ask Francesca Frelick , or read the back of her shirt. 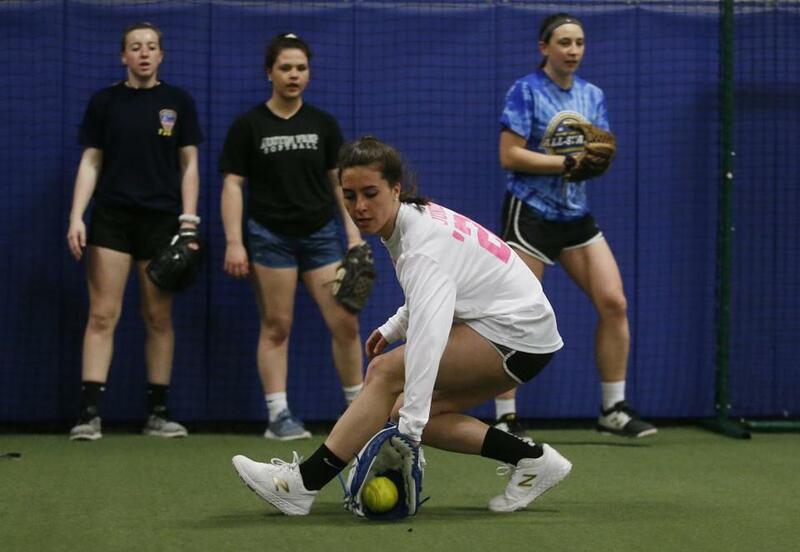 The junior catcher donned a black and pink AP softball T-shirt during practice on Monday at The Cage in Woburn, where the Cougars relocated after their season opener against Pope John was canceled due to poor field conditions. The shirt, from the 2017 season, had the two words printed across the back. For the past three seasons, Austin Prep has been crowned the Division North champion — only to fall in the state bracket. Last year, the Cougars went undefeated before falling in the state semifinal. They reached the state final in 2016 and 2017. The common denominator in this trio of tournament runs was 2018 graduate Logan MacDonald , a three-time Globe Player of the Year. In five seasons with the Cougars, MacDonald struck out 941 batters. She amassed a 0.49 ERA during her senior year. The focus turns to replacing her prowess. Austin Prep isn’t pretending that MacDonald, who has appeared in six games (18⅔ innings, 29 hits, 4.50 ERA, 12 strikeouts) in her first year at Babson, won’t be missed in the circle. But the Cougars have a plan in place: one that returns offensive power, offers a new defensive focus, and centers on relationships throughout the team. 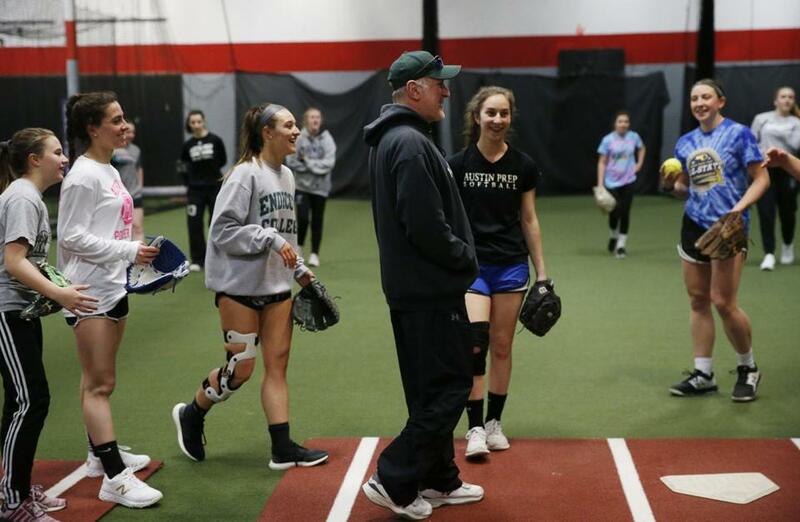 Austin Prep softball coach Frank Sorrenti shares a laugh with his players at practice. Senior Serena Gilbride , who earned her first varsity win last April, will fill in on the mound alongside freshman Brianna Meroli . 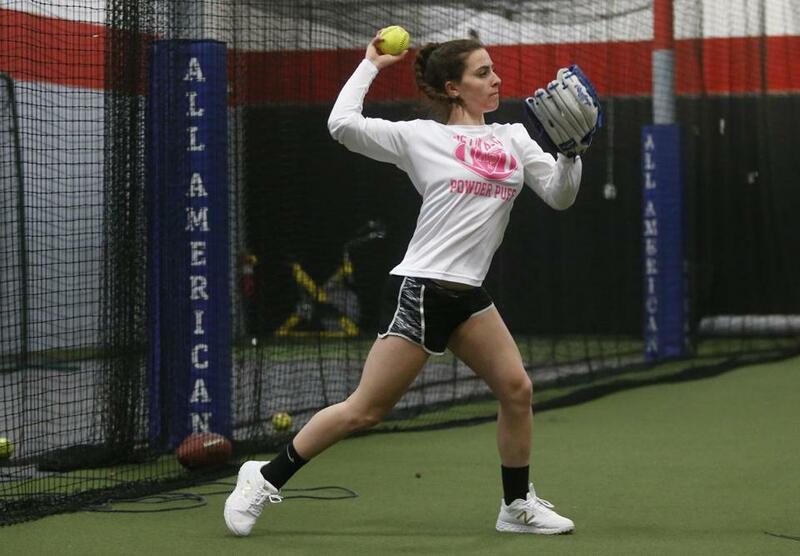 Gilbride threw a one-hitter to lead her East Boston Waves club team to a divisional title last summer and has prepared an arsenal including a fastball, curve, drop, and change-up. 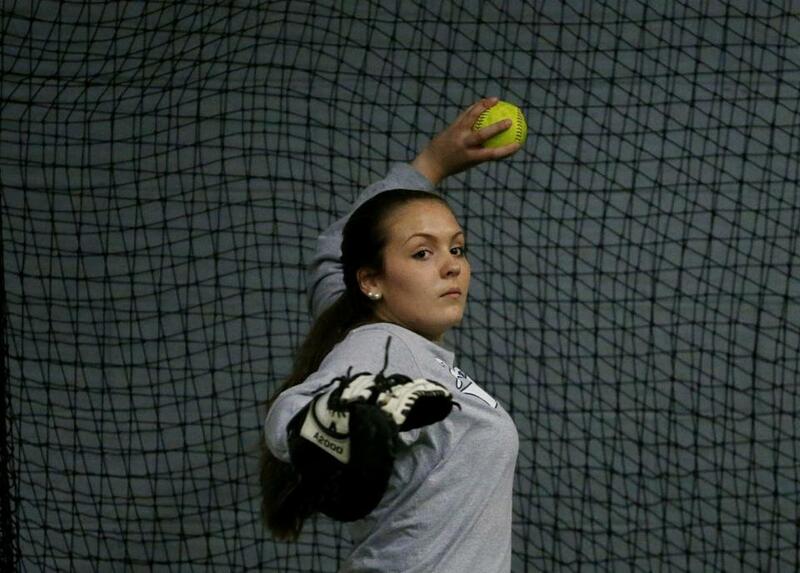 Austin Prep’s Serena Gilbride works on her game at The Cage in Woburn. 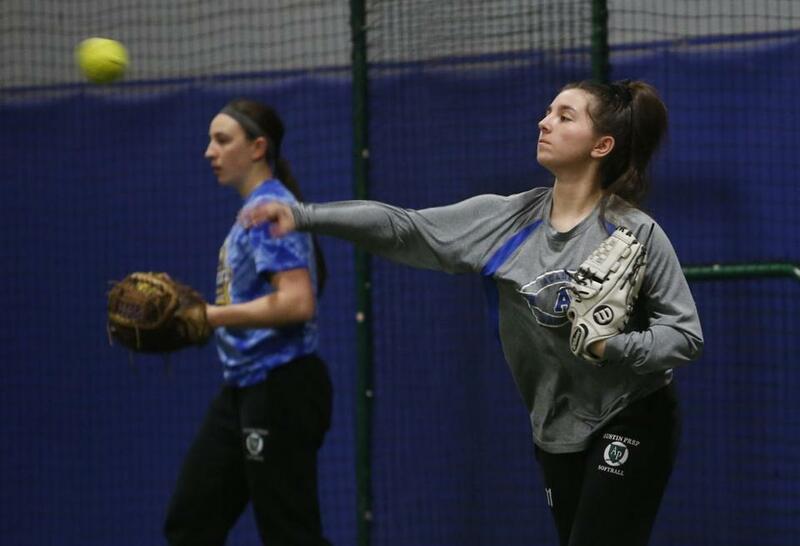 The Duke-bound Frelick, a three-time Catholic Central All-Star who hit .569 with 10 home runs and 44 RBIs last season, exudes full confidence in her new batterymate, both for Gilbride’s skills and their relationship, which Frelick said is crucial to success. Center fielder Lauren Sablone joins Frelick in pacing the Cougars’ offense. The junior from North Reading led AP in hits (41) and stolen bases (15) during the regular season, slamming five triples and three home runs to boost herself to a .547/.605/.920 slash line as a sophomore. With the loss of such a presence in the circle, the Cougars will have to back up their offensive power with stronger defense. Saracco and fellow senior first baseman Alexandra Santostefano will command the infield. There are six newcomers, including Meroli, on the Cougars’ roster. The group has bonded quickly, said the upperclassmen, over captains’ practices, scrimmages, and lots of post-practice ice cream. And while the older players look to instill confidence in the program’s future, the on- and off-field friendships could turn into a symbiotic relationship of sorts, one that the Cougars believe will lead to more success. Brianna Meroli winds up to pitch at Tuesday’s Austin Prep practice. Austin Prep’s Francesca Frelick goes to her backhand to field the ball at The Cage in Woburn. ■ The bats are alive early for a young West Bridgewater team that has scored 70 runs in just three games. After losing some key hitters from last year’s team, including All-Scholastic first baseman Casey Willis , there was concern that the Wildcats offense might take time to flourish. But with a strong veteran presence led by senior Morgan Doherty , junior Meg Willis, and sophomore Colleen O’Toole, the Wildcats have been almost unstoppable at the plate. O’Toole paces the pack with an .875 average and four home runs while Willis (.538) and Doherty (.600) are also off to strong starts. ■ Following an 0-20 season and 21 straight losses overall by Sharon, lightning finally struck in the form of a 12-7 win over Milford last Wednesday. It was the Eagles’ first victory since May 24, 2017, and it came over a league powerhouse that outscored Sharon, 47-2, last season. The Eagles got a strong pitching performance by freshman Trinity Payne , who also hit a home run to help her own cause. Classmate Savannah Gray notched four RBIs in her first varsity start. ■ Former Silver Lake pitcher Maddy Barone took home her third Northeast 10 Pitcher of the Week award in four weeks with a dominant 4-0 record over the past week for Southern New Hampshire. Barone, who is unbeaten in her last 14 starts, allowed just two runs while striking out 25 in 27 innings of work. In four years at Silver Lake, she went 80-9 and tossed 10 no-hitters. Wednesday, No. 1 Taunton at King Philip (at Plainville Athletic League Complex, 3:45 p.m.) — These Hockomock heavyweights met three times last year and produced a trio of tremendous games. The Warriors handed Taunton its last loss — 23 games ago — on their home field last season. Thursday, Attleboro at Bishop Feehan (3:45 p.m.) — A rematch of last year’s D1 tournament opener, the Shamrocks aim to silence the Bombardiers bats in the first installment of this cross-town rivalry. Friday, Dartmouth at New Bedford (4 p.m.) — The Whalers are off to a hot start paced by their offense, but can they keep it going against Dartmouth’s stout defense and superb pitching? Monday, No. 2 Methuen at North Andover (at McEvoy Playground, 11 a.m.) — The Rangers’ first true test of the season comes against an upstart North Andover team with solid speed and defense. Monday, No. 12 Arlington at No. 3 Newton North (11 a.m.) — One of the biggest games on the early-season slate, the two ranked teams square off in a preview for a potential late Division 1 North tournament game. Tuesday, No. 7 Acton-Boxborough at Lowell (10 a.m.) — Lowell ended last season strong and is looking to carry over that momentum against a team that could vie for a state title. Jenna Ciccotelli can be reached at jenna.ciccotelli@globe.com. Dan Shulman also contributed to this story.